Trainer Paul Nicholls racked up eight winners at accumulative odds of 45,863-1 as Cyrname and Clan Des Obeaux led his dominance on 'Super Saturday'. Cyrname won the Ascot Chase by 17 lengths after Cheltenham Gold Cup contender Clan Des Obeaux, both under Harry Cobden, landed the Denman Chase. Brio Conti, Worthy Farm and Silver Forever were other winners in a five-timer at Ascot. The 10-time champion Nicholls also had a Haydock winner and Wincanton double. Nicholls said: "I knew the horses were really well and I knew they would run really well. It has been an amazing day." Meanwhile, the 2015 Cheltenham Gold Cup winner Coneygree was retired at the age of 12 after being pulled up at Ascot. British racing was enjoying its first weekend of action after a six-day shutdown because of equine flu outbreaks. Some trainers were unable to run their horses because of new vaccination rules, but Nicholls had stated that his team had not been affected. Cyrname produced the day's most striking performance on a bumper nine-race card at Ascot. Waiting Patiently, trained by Ruth Jefferson, was left trailing in second as Cyrname triumphed again after a 21-length win at the same track last month. "I had no idea he would improve like he has done. It is an astonishing improvement," said the Somerset-based trainer. 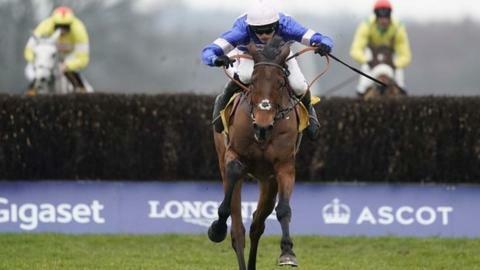 The horse - who prefers jumping at right-handed tracks - is unlikely to go left at next month's Cheltenham Festival. Nicholls indicated the Punchestown Gold Cup in April and the King George VI Chase at Kempton eight months later would be targets. The trainer won his 10th King George in December 2018 with the fast-improving Clan Des Obeaux, and this victory confirmed the seven-year-old as a leading player in the Gold Cup on 15 March. In other action at Ascot, Al Dancer - ridden by Sam Twiston-Davies for his trainer father Nigel - was an impressive winner of the Betfair Hurdle. Nicholls had a total of 24 runners on Saturday. The combined accumulative odds of his eight winners was 45,863-1. He also had three horses that finished second. Well, Paul Nicholls has been saying it for some time - that his Somerset operation was involved in an ongoing rebuilding process aimed at returning to the top of the tree where it perched so permanently in the days of Kauto Star, Denman and co. Afternoons like this when Nicholls banked hundreds of thousands of pounds and extended his lead over Nicky Henderson in the trainers' table, which is judged on prize money, are what he was targeting, and no wonder his odds of being champion trainer have been cut. Clan Des Obeaux did what was expected, but Cyrname was really striking - a name to remember.